FROM THE 1940s ONWARD, as contemporary art came to be increasingly dominated by abstraction, conceptualism, and minimalism, a group of painters in London doggedly pursued the depiction of the human figure and everyday landscape, forging startling new approaches and styles. Employing painting to record and revitalize intense sensory experiences, they rendered the frailty and vitality of the human condition, translating life into art and reinventing the ways in which their surroundings could be represented. 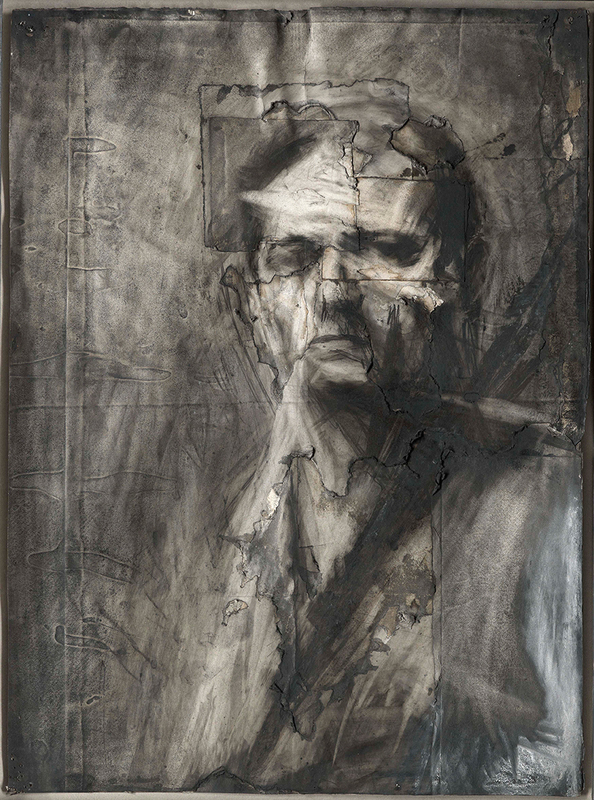 Drawn largely from the unrivaled holdings of the Tate in London, this is the first major exhibition in the United States to consider the work of six of the leaders of this “School of London”—Francis Bacon, Lucian Freud, Leon Kossoff, Michael Andrews, Frank Auerbach, and R. B. Kitaj—collectively, providing a timely reassessment of their extraordinary achievement. I think we thought our responses to people and circumstances and life were more important than nursing some systematic idea of what painting was all about. Andrews studied painting under William Coldstream at the Slade School of Art between 1949 and 1953. 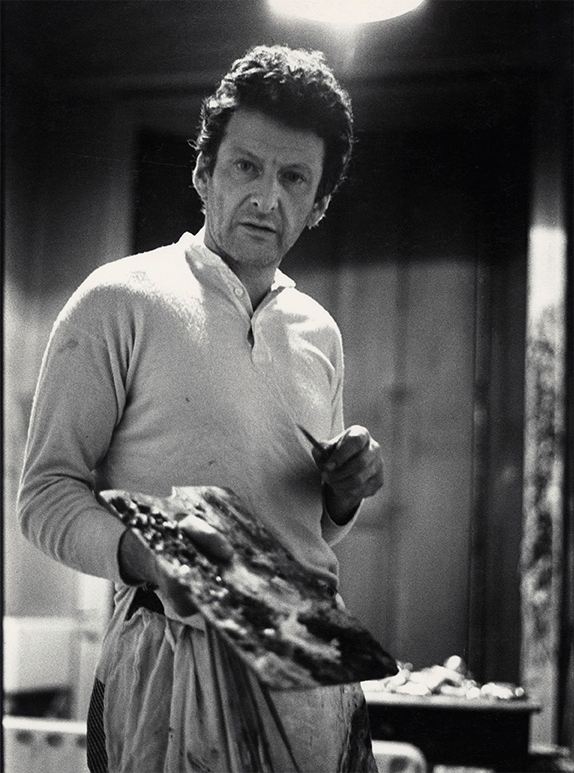 Lucian Freud, who also taught at the school, was an important example and offered encouragement, while Francis Bacon visited to talk about his work, making a memorable impression. Andrews pursued an existentialist type of realism, exploring the mysteries of human nature and man’s position in the world by studying the relationships between individuals and between man and nature. 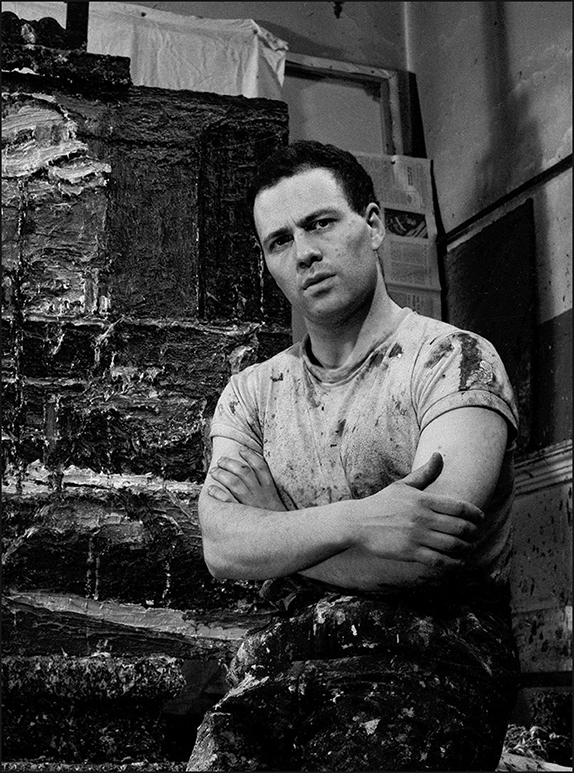 His first solo exhibition was presented at London’s Beaux Arts Gallery in 1958. From the early 1950s photographs became important sources in the creation of his work. I want to feel as if I am placing the brush on the place of the real thing itself. During this early period he concentrated on portraits of his friends and contemporaries as well as party scenes, developing his characteristic combination of meticulous observation with imaginative elements and implied narrative. 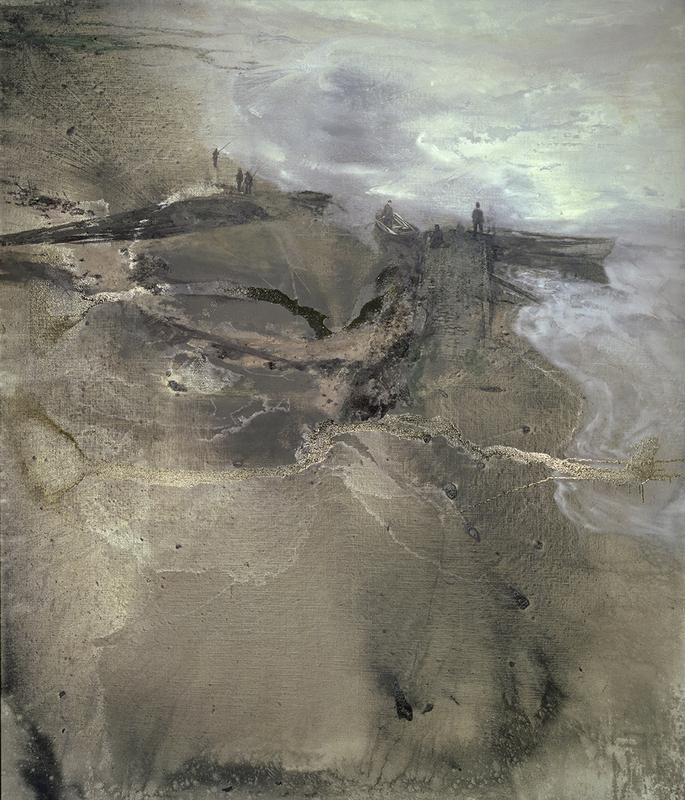 From the mid-1970s the landscape he encountered while traveling became the subject of many paintings. In the 1990s, after being diagnosed with terminal cancer, he chose the river Thames as his final, major subject. As soon as I become aware of what the paint is doing my involvement with the painting is weakened. Paint is at its most eloquent when it is a by-product of some corporeal, spatial, developing imaginative concept, a creative identification with the subject. 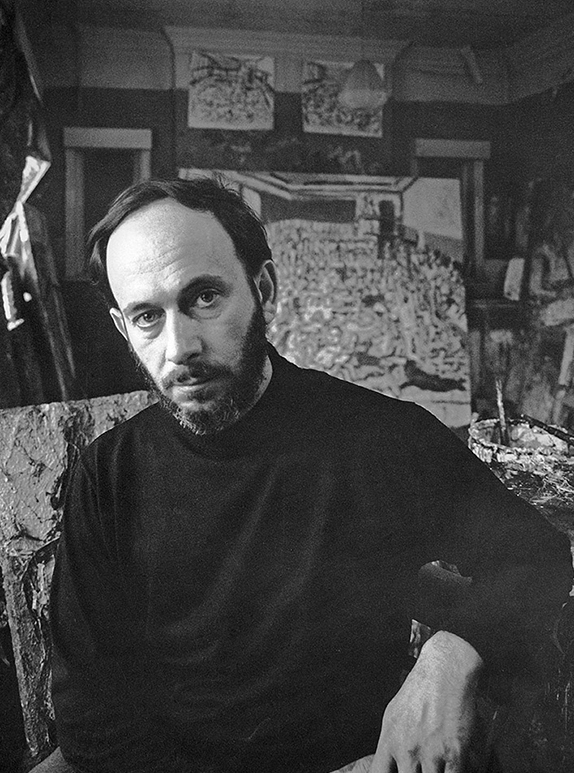 Born in Berlin in 1931, Auerbach was sent to England at age seven to escape Nazism. After the war, he performed in small London theaters and studied painting at the Borough Polytechnic under David Bomberg (famous for his injunction to pupils to discover “the spirit in the mass”), at Saint Martin’s School of Art, and the Royal College of Art. 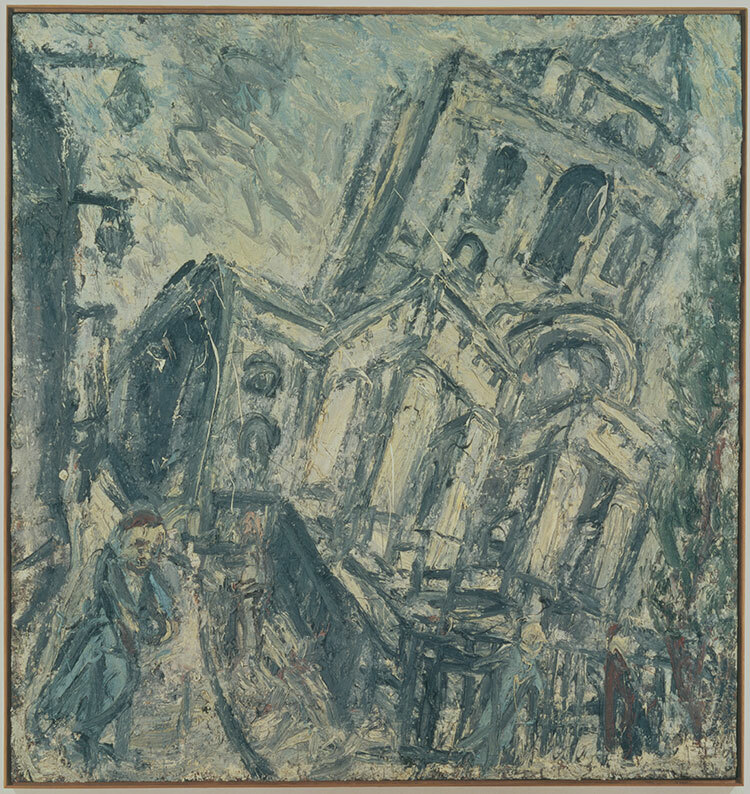 Auerbach’s early work focused on the human figure and numerous building sites in the British capital scarred by the war and undergoing reconstruction. In 1956 he had his first solo exhibition at the Beaux Arts Gallery. I finish pictures again and again several times a day until finally it seems to me that it has got a little something. He quickly became known for his thick application of paint. In the 1960s he began employing brighter colors and scraping down entire canvases rather than working on top of previous attempts, thus beginning the entire image afresh at each session and often spending months or years on a single painting. Recurring subjects are regular portrait sitters, Primrose Hill (a part of Regent’s Park in north London), and the streets of Camden Town, where he has been living and working since 1954. He still draws and paints 365 days a year. Ever since the age of twelve, I have drawn and painted London...the strange ever-changing light, the endless streets and the shuddering feel of the sprawling city linger in my mind like a faintly glimmering memory of a long-forgotten, perhaps never experienced childhood, which, if rediscovered and illuminated, would ameliorate the pain of the present. Leon Kossoff was born in east London. He studied at Saint Martin’s (where he and Frank Auerbach became close friends), at Borough Polytechnic, and at the Royal College of Art. 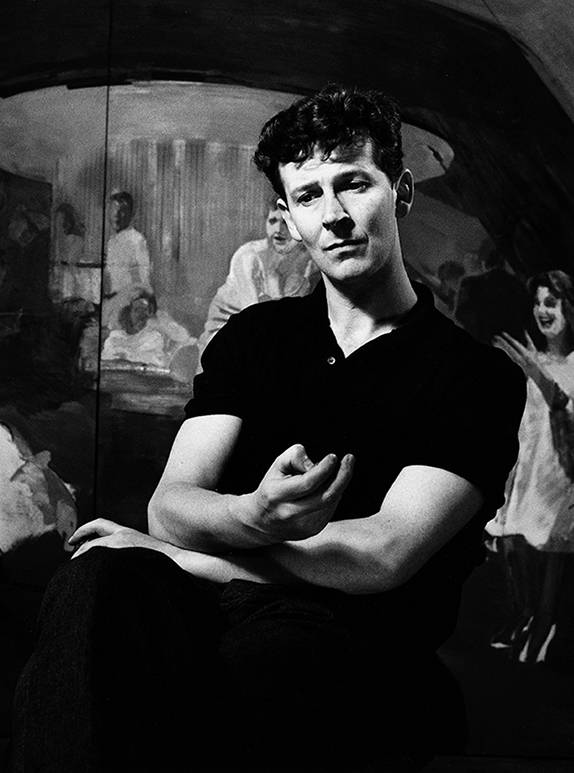 He had his first exhibition at London’s Beaux Arts Gallery in 1957. From the early 1950s Kossoff began painting a close circle of family and friends, producing pictures in which they acquired a solid, material presence, similar to that of the buildings and streets of London he also often returned to and knew intimately. Every time the model sits everything has changed. You have changed, the light has changed, the balance has changed. He developed a painterly style with thickly applied, constantly reworked layers of paint in characteristic earth colors. Early drawings were intensively worked as he repeatedly erased and restarted the image. He was to develop a similar process in his paintings, working on board and scraping down the paint with a palette knife before reapplying it. Kossoff lives and works in north London. It almost goes without saying, but a human image is only a part of the “sense” of a picture. It may only be like a first step. R.B. 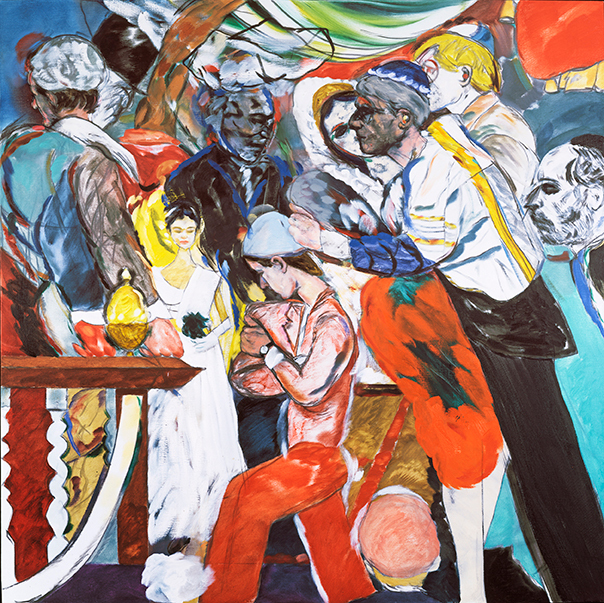 Kitaj was born in Cleveland. Among the members of his close family were first- and second-generation European Jewish refuges. Between assignments in the merchant navy and the U.S. Army, he studied painting at Cooper Union and the Academy of Fine Art, Vienna. Afterward, he moved to England to attend the Ruskin School, Oxford, and the Royal College of Art, London. His first exhibition was held at Marlborough Fine Art in 1963. 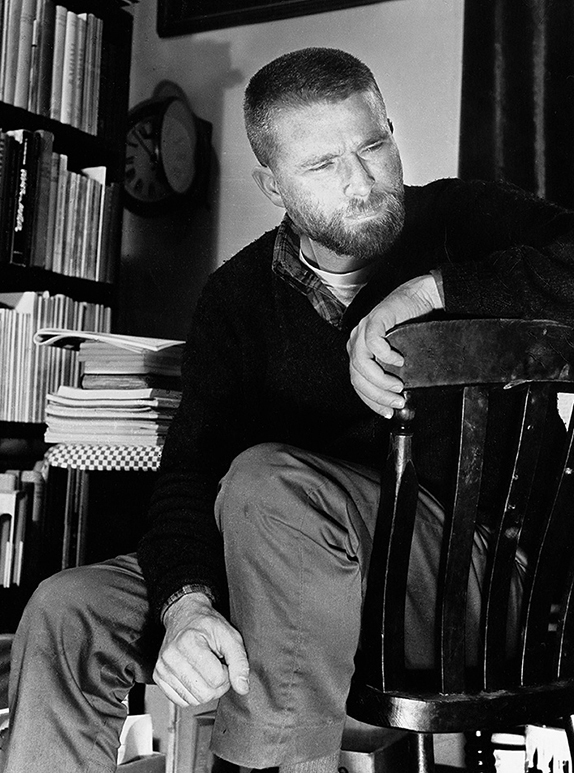 Around this time, Kitaj met Andrews, Auerbach, Bacon, Freud, and Kossoff, who were also with the gallery. 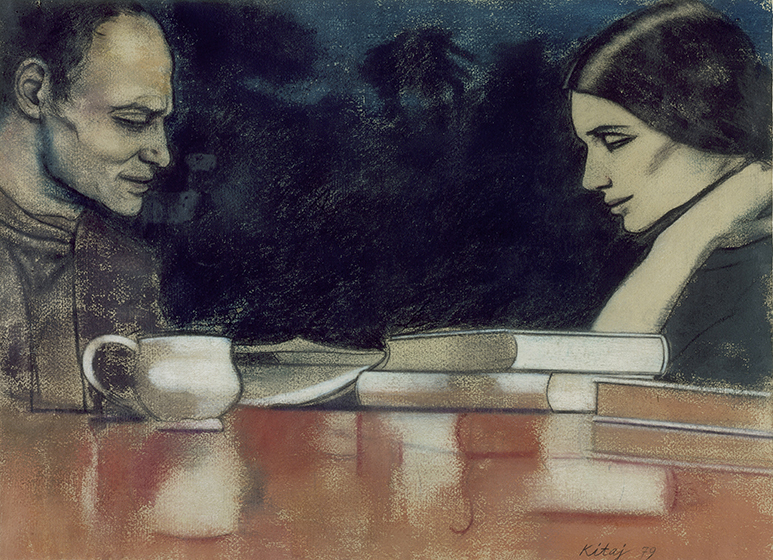 During the early 1960s Kitaj concentrated on combining figurative imagery with abstraction and began to incorporate collage into his paintings, drawing on photography and cinema and referring to historical events and political circumstances. For me, books are what trees are for the landscape painter. R. B. Kitaj, Time, February 19, 1965. In the mid-1970s he began to work increasingly from life, moving away from complex compositions to more straightforward figure studies. During the late 1980s he continued to read widely in Jewish culture — studying Walter Benjamin, Sigmund Freud, and Franz Kafka — and positioned himself more explicitly as a Jewish artist. In 1989 he published his First Diasporist Manifesto, analyzing the Jewish dimension in his art and his position as an outsider. In 1997 he left London and moved to Los Angeles, where he died in 2007. Real painting is a mysterious and continuous struggle with chance—mysterious because the very substance of the paint…can make such a direct assault on the nervous system; continuous because the medium is so fluid and subtle that every change that is made loses what is already there in the hope of making a fresh gain. 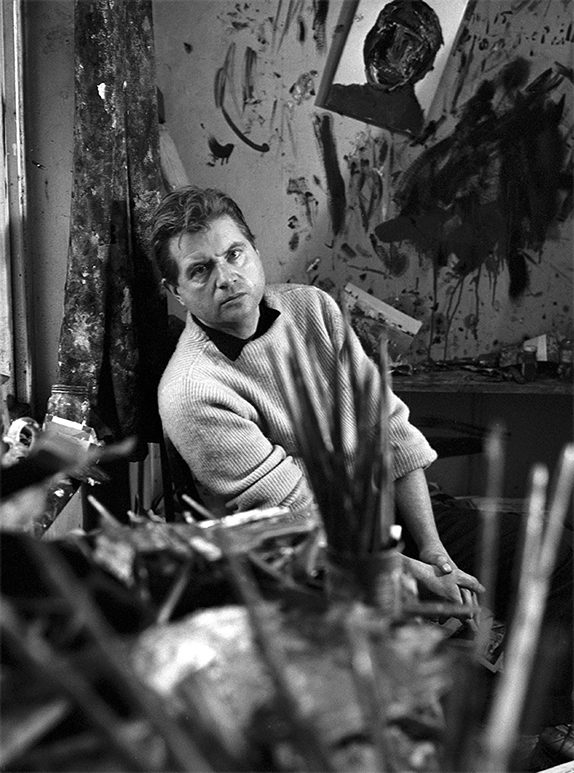 Francis Bacon was born in Dublin in 1909 to English parents. Bacon’s father, unable to face his son’s homosexuality, drove him out of the family home at age seventeen. After traveling to Germany and France he settled in London. He began painting and drawing in the late 1920s and worked briefly as a furniture and interior designer. He received guidance from an older friend, the Australian artist Roy de Maistre, but was otherwise largely self-taught. What I want to do is to distort the thing far beyond the appearance but in the distortion to bring it back to a recording of the appearance. 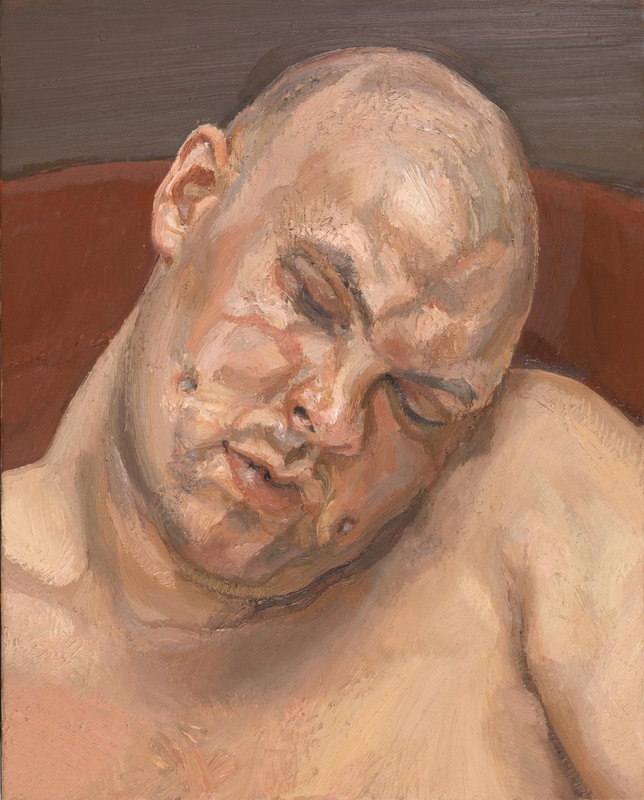 In 1945 the showing of a number of his paintings at London’s Lefevre Gallery established his critical reputation, and he became central to an artistic milieu in Soho that included Lucian Freud and Michael Andrews. In the mid-1940s he began using as starting points for his work reproductions of paintings, sculpture, photographs, and film stills, mostly imagery of angst that had historical significance but also resonated with him personally. From 1962 he expanded the range of his photographic sources by commissioning particular shots of models, mostly friends and lovers. He described his painting as an attempt to create an image of the cluster of sensations that an appearance arouses in him. I want the paint to work as flesh does. If you don’t overdirect your models and you focus on their physical presence, interesting things often happen. You find that you capture something about them that neither of you knew. A grandson of the psychoanalyst Sigmund Freud, Lucian Freud was born in Berlin in 1922 and moved with his family to London in 1933 to escape Nazism. He trained at the Central School of Art in London and at the East Anglian School of Painting and Drawing in Dedham. Freud had his first solo exhibition in 1944 at London’s Lefevre Gallery. Throughout his career he focused on the human figure, rendered in a realist manner and imbued with a stark and evocative psychological intensity. He described his work as autobiographical, many of his sitters being friends, lovers, and family members. I would wish my work to appear factual, not literal. 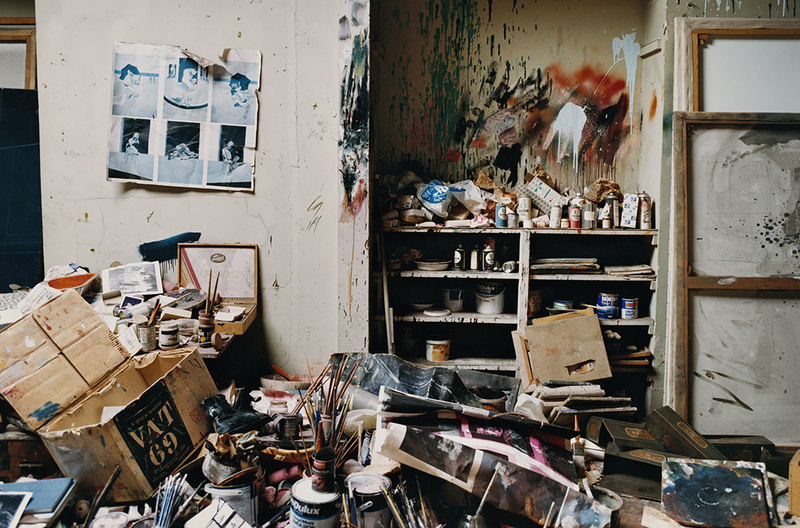 In the 1960s Freud progressively moved from the linear approach of the 1940s and 1950s to a looser, broader paintwork. While the human figure remained Freud’s enduring preoccupation, always painted from life in the presence of the model, he occasionally tackled other themes, such as his garden and the view from his studio. Drawing is not a mysterious activity. Drawing is making an image which expresses commitment and involvement…rejecting ideas which are possible to preconceive…destroying images that lie, discarding images that are dead. Drawing for Auerbach and Kossoff, etching for Freud, and printmaking for Kitaj are not secondary but complementary to the medium of painting, one informing the other in their practice. 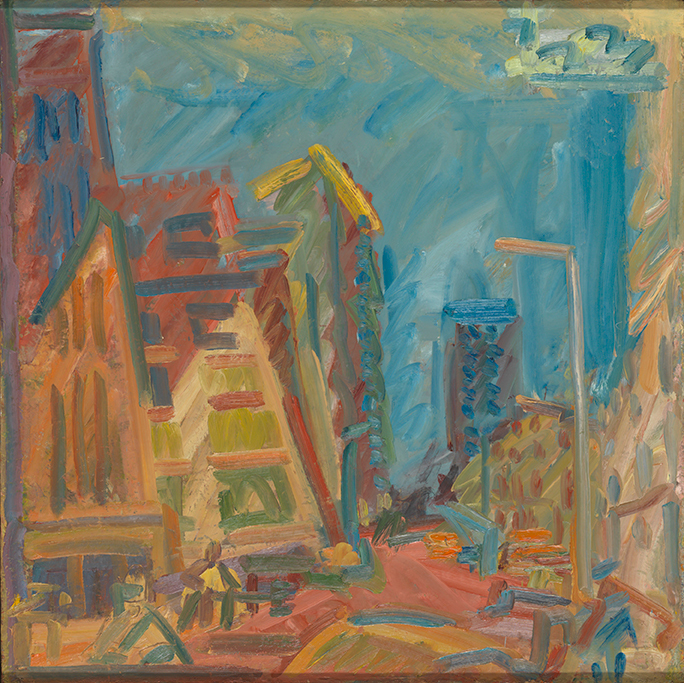 Both Auerbach and Kossoff have consistently worked on elaborate figure drawings, while also sketching daily the streets and buildings of London. Until the 1970s Freud predominantly focused on drawing, developing the linear approach that also defined his early paintings. From 1982 etching became a constant part of his work. As with Auerbach and Kossoff’s most accomplished drawings, which can take months if not years to complete, each one of Freud’s etchings also typically occupied months of the artist’s time and were consistently done in the presence of the sitter. Following Kitaj’s introduction to screen printing in 1963, he began to use it as a way of combining diverse media into new configurations. Bacon for most of his life famously declared that he did not draw and did not make preliminary drawings in the traditional sense. Nonetheless, a number of sketches have been preserved, showing his investigation through drawing of the relationship between figure and background and the unfolding of figures in space.